Kitty cats, bikinis may be viewed as the biggest essential for the summer months; and while they are extremely important for those looking to bronze their bod on the beach, I like to think of a fabulous pair of shoes as the numero uno item a glamorous girl needs to complete her warm weather look du jour – a pair of sassy slippers that look just as darling on one’s tootsies as they do dangling from perfectly manicured fingers while strolling under the boardwalk with a cute boy in tow. Now one (1) of you lovely lambs has the chance to make a pair of the Turquoise Stone Sandal your very own. That’s right, my loves; Café Fashionista has teamed up with Starla Sandals, a one-stop shop for all of your fabulous summer footwear needs, to bring one (1) ravishing reader a pair of sizzling sandals, perfect for showing off your pretty pedicure! ♥Visit Starla Sandals and choose your favorite piece. ♥For one (1) entry, leave a comment on this post stating what your favorite Starla Sandals item is between now and Friday, July 16, 2010 at midnight PST. ♥For two (2) entries, Twitter about this giveaway, and leave a comment on this post stating what your favorite Starla Sandals item is between now and Friday, July 16, 2010 at midnight PST with your Twitter URL. ♥For three (3) entries, become a follower of Café Fashionista on Blogger/Google Reader/Google Friend Connect/Twitter, and leave a comment on this post stating what your favorite Starla Sandals item is between now and Friday, July 16, 2010 at midnight PST (if you are already a Café Fashionista follower, please say so in your comment). I will randomly pick one (1) name out of a hat (who knows, it could be yours! ), and announce the winner on Saturday, July 17, 2010. Winner will be able to choose the size they desire – 6.5, 7.5, 8.5, 9.5, 10.5, or 11.5. Thanks to Starla Sandals for the picture. Ohh! So Chic, I love the pair you show with the Turquoise. Oh nice! I love the turquoise! My fave is the Gold Luxe sandal. Very chic! I love love love the Gold Diamond Sandal. Thanks! What an awesome giveaway, Erika! These sandals are gorgeous. I think the gold starburst sandals are my fave. Hope you have a wonderful weekend! love the gold brilliance or the pink diamond sandal. perfectly elegance and summer casual at the same time! love your pick! i would go with the turquoise stone sandals as well! I know I've said this before, Erika, but you seriously have the best giveaways EVER. I checked out the website and almost died. Every single pair of sandals is GORGEOUS. I can't choose a favorite, I'm afraid. Instead I chose three. Ha! I love the gold brilliance pair, the pink diamond pair, and the turquoise stone sandal pair (which I think you pictured above). I tried to tweet but I think twitter is down now. Sigh. Thanks for the giveaway, it's amazing!! I have to pick the one you showed in this post, the Turquoise Stone Sandal, they are so cute!! Starla certainly has nice stuff. I like the platinum floral sandals! Oh I have always coveted a pair of turquoise encrusted sandals in just this color of pale sky blue! Hoping that I will be the ravishing reader to win this! Wishing you the merriest & brightest of July 4ths! Give your kitties a big kiss for me! My favorite sandals are Platinum Opulence Sandals. Very cute! I love these sandals. The black onyx is amazing! They're all gorgeous, but I think I'll go with the Turquoise Stone pair. I love blue. You really notice that thing about Brigitte. GREAT. Love you're lovely comments, thank you so much. And I'm a follower via Google Reader!! My favorite is the Turquoise Stone sandal! I love the color and the design. So pretty! Thanks for this lovely giveaway. ENTERING. I actually really love those sandals! 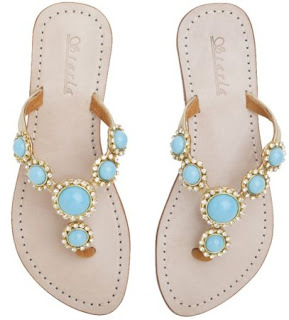 Turquoise is such a fabulous and fresh colour for summer = AWESOME sandals. Oh, I adore the turquoise pair you are giving away, but truly all of their designs are pretty. I'm a follower already, love your blog! I adore the Pink Diamond Sandals - so pretty & perfect! Fabulush giveaway gorgeous girl! great pair of flip-flops! don't forget to check out my blog tomorrow for a really great giveaway! it has to do with photography, that is all I will say...oh and nyc ! Have a great 4th of July!! I'm a follower. I love their sandals... the Pink Diamond sandals and the Platinum Opulence sandals are my faves. I wish I was going somewhere where these would come in useful, they're so pretty and thanks for your lovely comment, it made me smile! i love the turquoise ones and the gold and silver opulence ones! great giveaway! these would be perfect for my hawaiian honeymoon in september. so sweet! & very charming. This might be my favorite giveaway ever! Platinum Opulence is striking my fancy! I follow you of course here on just became a Twitter follower. Not sure how I wasn't already?? Tweeted @BonBonRoseGirls! Invitation: a new blog for women and girls! Click in the flag of the EUA/UE. Read in your language. Join! wow, I love the Onyx Starburst Sandals, Gold Luxe and GOLD starburst sandals, but I think my fave would be Platnium Floral Sandals :D Wouldn't match to a lot of my things, but to some - yes. I am following you. I follow u thru GFC and Twitter. Gold Opulence Sandal is my fave. The Onyx Floral Sandals are my favourite, simply because I already have white sandals, and would love something black, as it doesn't get dirty so quickly. 3 entries for me please! I'm already a follower on Blogger! That is the sweetest pair of sandals! I'm already following Cafe Fashionista on Google Reader and Twitter, my name is Donna Vitan. I gotta say, these Turquoise Stone Sandals are my favourite! Please, please send your good luck vibes my way! I love the Onyx Stone Sandal. How gorgeous!! And I am already a follower! Love the shop! Count me in :) I like the Turquoise Stone Sandal. Love. and my favorite pieces are Platinum Floral Sandals. soo classy. Great giveaway! My favourite are the Onyx Floral Sandals, but I like them all. Tweeted and I am a follower as well. So fab! My faves are the ones you are giving away but I also really like the Platinum Opulence Sandal. I follow on Bloglovin' and Twitter. Gold brilliance is quite pretty! Lovely giveaway dearest! OMG is this still going on...I love those!! I didnt even know it was a contest when I first saw the photo...and said to myself...WOW what a beautiful pair of sandals! Just wanted to stop by and say, I LOVE your blog! Also, I'm a Starla Sandal fan. I just got the "Pink Diamond" pair, and let me tell you guys, they are BEAUTIFUL! Very good quality sandals and the bling is just Fabulous! Not only are they beautiful but comfortable. I Love my Starla Sandals! Pink Diamond Sandal would be my favorite but the turquoise is also my favorite!!! Hard to choose. The Pink Diamond sandals are my favorite. Definitely love the gold luxe sandals! And I'm a follower on Google Friend Connect. Count me in, darling! The gold luxe pair is pretty darn cute too. The Platinum Opulence Sandal is my favorite. I absolutely love the Platinum Opulence Sandal! And I am a google reader follower and your blog is always the first to visit! Oh what a fabulous giveaway! I am in love with the Onyx Stone Sandal - I just must have those! Love your blog! Wow what a great giveaway Erika ! I think my mom will like it . Haha . I love Gold Brilliance, lovely ! My fave pair are either the turquoise stone or the onyx sunburst. So pretty! My favorite piece is the Onyx Stone Sandal! My favorite is the Gold Opulence Sandal! It is gorgeous!! !